Tickets are distributed free of charge via an online lottery system, allowing guests from across the United States to participate. All attendees must have a ticket. The 2013 lottery opens on Thursday, February 21, 2013 at 10:00 a.m. EST and closes on Monday, February 25, 2013 at 10:00 a.m. EST. To apply, visit www.recreation.gov. Lottery winners will be contacted on March 1, 2013. 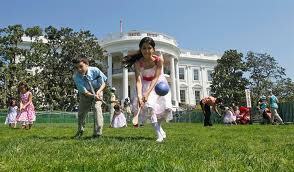 Signing up for the 2013 White House Easter Egg Roll lottery is free. The deadline for lottery entries is at 10 a.m. Feb. 25. Lottery results will be available on March 1. You will need to create a free account at recreation.gov to be able to enter the lottery when it opens. The White House Easter Egg Roll is an annual family event to hunt for and race Easter Eggs on the White House Lawn while enjoying storytelling and a visit with the Easter Bunny. The holiday tradition has a long history dating back to 1878 when President Rutherford B. Hayes officially opened the White House grounds to local children for egg rolling on Easter Monday. Successive Presidents have continued the tradition of inviting children to the White House Lawn for egg rolling and other activities and entertainment. The White House will open the South Lawn to children age twelve and under, along with their families, to enjoy sports, cooking classes, live musical performances, storytelling and the traditional White House Easter Egg Roll. The 2012 event featured the theme of “Get Up and Go!” promoting health and wellness with activities that encourage children to lead healthy and active lives and follow the First Lady’s ‘Let’s Move!’ initiative. The 2013 theme will be announced soon. Date of the White House Easter Egg Roll: April 1, 2013, 8 a.m. – 5 p.m.
All attendees will be required to go through a security screening process. No food or beverages are allowed on the grounds. Duffel Bags, suitcases and backpacks are not allowed. Strollers, diaper bags, baby formula, and baby bottles are permitted. More information about the event is available at www.whitehouse.gov/eastereggroll.